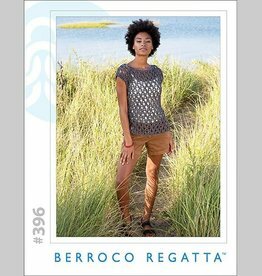 Berroco Regatta works up quickly using big needles or hooks. Made from 100% cotton, this bulky weight tape yarn is great for both crochet and knitting. Work Regatta at a larger gauge to create garments that are airy and great for layering or at a tighter gauge for chic accessories. Available in a wearable color palette that blends blues, browns, and greys. A collection of six quick to knit patterns for bulky weight Berroco Regatta ribbon yarn. 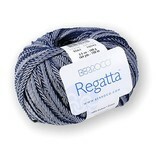 Regatta looks great in these simple garments and accessories.